In accordance with the announced upcoming communication services sector change, the new Communication Services Select Sector Index is now live. The select sectors are based on the Global Industry Classification Standard (GICS®) but have different construction rules than the sectors of the S&P 500. In the Select Sectors, each index is made up of all stocks in the GICS sector unless otherwise noted in the table below. Source: S&P Dow Jones Indices. S&P U.S. Indices Methodology. 1 The Communication Services Select Sector Index reflects the changes in the GICS structure effective in September 2018. 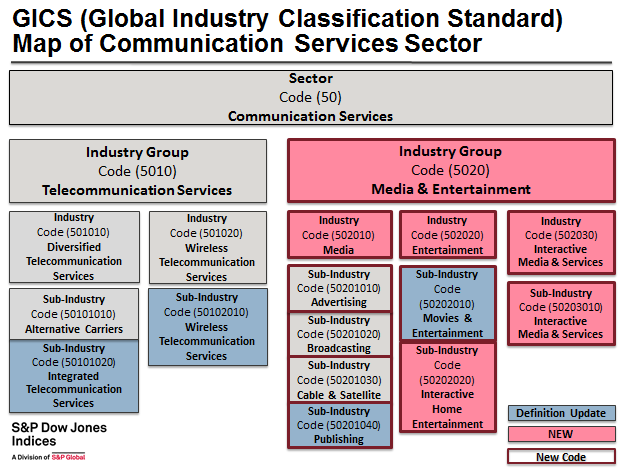 For more information regarding the composition of the Communication Services Sector, please refer to Appendix D. S&P Dow Jones Indices has created back calculated history for the Communication Services Select Sector Index based on the securities in the headline S&P 500 that would have hypothetically been classified as GICS Code 50 at that time under this new structure. 2 In order to align with the GICS structure changes effective in September 2018, S&P DJI will remove stocks classified as Communication Services (GICS Code 50) from the Technology Select Sector Index. 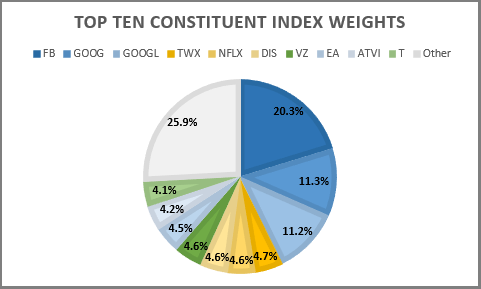 Furthermore, the weighting of the constituents inside the select sectors follows the capped market capitalization weighting. In short, there is a quarterly rebalancing where each company is float adjusted market cap weighted with capping to limit companies to under 25% each, and to limit the sum of companies with weights greater than 4.8% to under 50% of the index (The full details of the weighting can be found in the methodology on pages 12-13). Source: S&P Dow Jones Indices. For new definitions, please click here. Now that the Communication Services Select Sector Index is launched, here is what it looks like on the inside with return results based on ten years of backtested history. The index has 26 constituents with a total market cap of $2.35 trillion, average market cap of $92.5 billion and median market cap of $34.9 billion as of May 16, 2018. 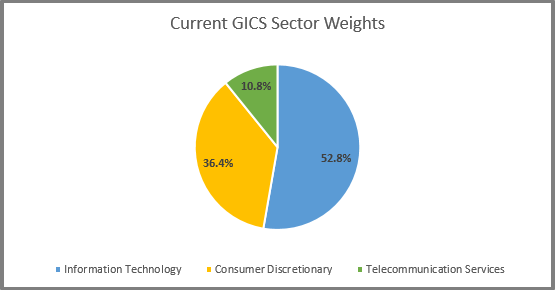 The constituents are from the current GICS classification sectors of information technology (blue,) consumer discretionary (yellow) and telecommunications (green.) There are 6 constituents from Information Technology with a total market cap of $1.24 trillion, 17 constituents from Consumer Discretionary with a total market cap of $856.6 billion and 3 constituents from Telecommunication Services with a total market cap of $254.2 billion. Source: S&P Dow Jones Indices. Data as of May 16, 2018. Lastly, the index level history and performance below uses data from Dec. 21, 2007 based from 100 that is backtested before the launch on April 30, 2018. The Communication Services Select Sector Index returned a cumulative 143.5% through May 16, 2018 with annualized performance of 14.2% over 3 years, 12.7% over 5 years and 9.9% over 10 years. The index also has a one year return of 11.6% and is up 3.8% year-to-date. Source: S&P Dow Jones Indices. Launch date is April 30, 2018. All prior data is backtested.